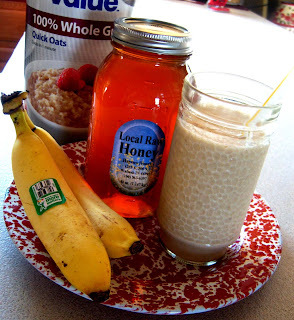 Sharing what I've been "addicted" to for the past month or so........Oatmeal Banana Smoothies! I think I have one about every day (it usually serves as my lunch)...such a refreshing treat! I absolutely love the texture and taste the oatmeal adds to the smoothie. Now I'm not one of those people who meticulously measures things --- I just dump --- but I'll give you the ingredients I use and you can experiment till you get it to taste the way you like. I put the oatmeal in the blender 1st (about 1/2 cup or so) -- blend till it becomes powder like. Add the honey and milk and blend till pureed. Last of all add ice cubes till it thickens and reaches your desired texture. Thanks for your sweet comment on my blog and for sharing your smoothie method. This sounds delicious - and like a great way to get some whole grains into your diet, too. Have you ever tried freezing banana slices to use in it? I tried this for the first time last year and was surprised how ice-creamy the textures was!